Joseph Mallozzi's Weblog: July 19, 2010: Masked hits the street! Last days of Atlantis! Mailbag! July 19, 2010: Masked hits the street! Last days of Atlantis! Mailbag! 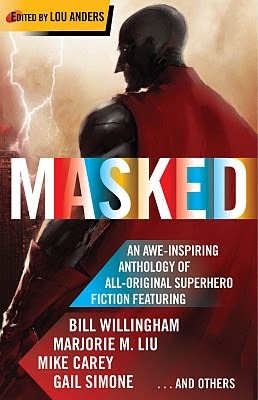 Masked: An awe-inspiring anthology of all-original superhero fiction edited by Lou Anders! Need I remind anyone that Masked is our September Book of the Month Club selection? Pick it up, read it, then join in the discussion that will include appearances by editor Lou Anders and several surprise guest authors including – if I’m available – myself. Author Daryl Gregory (whose “Message from the Bubbles Gum Factory” is one of my favorite stories in Masked and who will be joining us to field your reader questions in support of his novel, The Devil’s Alphabet, our August Book of the Month Club selection), assures me that he and Fables scribe Bill Willingham will be on hand to heckle. I seem to have stalled on the script front. It would seem that lately, the greater part of my day is spent: a) fixing things around the house, b) booking a repairman, c) waiting for said repairman, d) re-booking the repairman so that he can return and complete work on the defective whatsit because he didn’t have a replacement part in his truck when he came the first time, e) anxiously waiting the repairman’s return and jumping up to answer the door whenever I hear a car pull up only to discover its a family checking out the open house across the street . Yes, in that order. I also managed to squeeze in some hiragana study, filing, work on my tax installments, and this blog. Tomorrow, however, is the day I finally make progress on The Hunt. Onward to Act the Second! Akemi made cooked oysters for dinner today. Okay, in some instances half-cooked. Normally, I wouldn’t worry. After all, I eat raw oysters all the time. Except that these particular oysters contained a warning on the package that read: “These oysters are for cooking! NOT to be consumed raw!”. I’m going to take that as more of a suggestion and hope for the best. Answer: Sorry. All I know is we’re moving to Tuesday nights and we’re premiering in the last week of September. Answer: Sure, but they’re about as common as four leaf clovers and humble NBA stars. Answer: Sun Sui Wah on Main St. It’s always very good, but she prefers the more high-end offerings of Sea Harbour Seafood in Richmond. Answer: She’s back to her limpy pre-treatment self. I look forward to seeing if she shows any progress when she’s finished her meds. Answer: That’s a question for SyFy. Answer: He did while he was there. Now he’s making me jealous with his L.A. Foodie experiences. Answer: We can assume they’ve been captured – until a story comes a long that upends that assumption. I don’t think we’ve heard the last of goa’uld Kinsey. Answer: It’s certainly possible but, at present, there are no plans to do so. Answer: Damn that’s old. If Destiny is older than the Milky Way gates then yes. Answer: I don’t believe they were. Answer: Okay, here’s a variation of a fantastic pork chop recipe from America’s Best Test Kitchen. Get yourself a chicken breast and pound it flat. Dip it in a bowl of egg whites, then dredge it in flour, garlic powder, pepper, salt, paprika (or cayenne powder), dried oregano, and thyme. Make sure it’s well coated, then set it aside. Fry up five strips of bacon over medium heat in a cast iron pan. Set the bacon aside and add vegetable oil to the bacon drips and bring the heat up to medium-high. Re-dredge the chicken in the flour mix, shaking off the excess, then set it down in the pan. Cook until the underside is golden brown (usually 2-3 minutes) then flip and do the same. Set it aside and let it sit for five minutes, then serve with a side of roasted yams and gravy and/or top with caramelized onions. Oh, and don’t forget to turn off the stove. Answer: No but Bubba once negotiated a veritable Rude Golberesque series of steps to get at a bag of milk chocolate-covered almonds. He succeeded. And had explosive diarrhea for two days. Answer: I rate them right up there – although Amedei remains my favorite. Answer: Alas, no promotion for either but something just as good: a hearty handshake, a thank you for a job well done, and half-price season tickets to the Clippers. Answer: Yes, and it would make this ungodly whining/whirring sound whenever it crept along. Answer: Apparently, there was a secret message hidden in the stairs, and the only reason I know is because some enterprising fan actually translated it! Don’t recall what it said but I believe it was “Don’t forget to eat your ovaltine”. Answer: Fear not. There are plenty of Ancient fans in the writers’ room more than willing to keep the dream alive – so I don’t have to. Answer: Brad and Robert are the keepers of the official timeline. If you’re going to Comic Con, get Rob to give a detailed rundown. Answer: The kinos were originally planned for Atlantis, but never made it into the series. Chances are some may exist in some distant Atlantean storage closet. Answer: Two weeks ago, I would have said no but given the change in the timeline of events then I would say, yes, it’s probable that Atlantis personnel have been incorporated into SG teams. Answer: No problem and I appreciate your taking the time to post, critiques and all. Answer: That’s totally unnecessary. A simple condo in Tokyo would be fine. Quade writes: “Hey I was just thinking about picking up Masked on tuesday when I noticed you were a contributing author. So I have since decided against it, but I digress. Answer: Check the blog’s sidebar. Masked is September’s Book of the Month Club selection! Editor Lou Anders will be swinging by the blog (along with a few other guest authors) to field your questions. I may even answer a few as well. To answer your question – I was sent an advance copy of my story which I proofread. I sent the requested changes to Lou who passed them on to the publisher. Answer: It all depends on who is paying for them and what kind of a return they get on that investment whether it be monetary or in the form of more eyeballs. At present, I don’t think there’s money to be made and their impact on viewership is debatable. metalfan20 writes: “First, Will we see the SGC any time soon on SGU? Answer: No plans on seeing the SGC in the near future. As for the movies – the only thing any of us can do is be patient. Answer: Nope, no plan. The writers usually come in every morning, think up a scenario (ie. the team visits a planet ruled by minotaurs) then head down to set and inform the actors who basically make up the dialogue while the director shoots. So far, this approach has served us well. Answer: We will be seeing more of the impact you’re alluding to in the back half of season 2. Answer: The old gal is eleven. Answer: 1. The script is in the process of being written so I can’t compare page count, but going on what we discussed in the room – yes, it will be bigger. Answer: We wouldn’t build the set for one episode and instead use pieces presently in storage and green screen. That is, of course, if we plan on seeing the Atlantis interior. Answer: I’ll hit SF first, followed by Fantasy, then Horror. I’ll also head over to the Fiction section as some of my fave authors (ie. Jeffrey Ford) are occasionally shelved there as well. Answer: I couldn’t even hazard a guess. Answer: In which case I’m sure it’ll be no problem for you to dig up an example of my replying in a “churlish and snide” manner to someone who politely asked a question. Answer: Really? How interesting that, only days earlier, you were accusing me of being thin-skinned. Allow me to take a moment to apologize if my comment about feeding cranky fans to Todd hurt your feelings or frightened you in any way. I’d like to make it clear that I have no intention of feeding cranky fans to Todd or any wraith for that matter. The truth is the wraith are fictitious characters that exist solely within the fantasy setting of the t.v. show you and fellow cranky fans are expending an impressive amount of time and energy decrying. For what it’s worth, given the opportunity, I would not feed cranky fans to the wraith. I would feed them to crazed baboons instead. Sorry to hurt your feelings again. Just kidding. Yes, I am. Just kidding. Answer: You paraphrase but, yeah, at the end of the day the show is what it is, darker tone, flawed characters, communications stones and all. What do you want me to say? Many fans have enjoyed the second half of the first season because they felt that some of the issues they’d brought had been addressed in the back ten, but those episodes were simply a progression of what we’d already established rather than an overhaul in the creative. Answer: Sorry. I just couldn’t leave this one to flounder in yesterday’s comments section. Answer: How do you know what I’m weari- ?! Oh, you’re referring to Akemi’s picture. Uh, right. Yeah, they’re all the rage in Tokyo. (P.S. Looking forward to that return trip in December). Previous Article July 18, 2010: Chocolate and dogs don’t mix! Except on this blog. Next Article July 20, 2010: Charting Jelly’s progress! The Masked soundtrack! Last days of Atlantis II! Your Answer: We can assume they’ve been captured – until a story comes a long that upends that assumption. I don’t think we’ve heard the last of goa’uld Kinsey. Damn. Won’t get to my regular book supplier before next week. Guess I’ll have to drop in the local big box bookseller and grab a copy of the book. The pics are greatly appreciated. 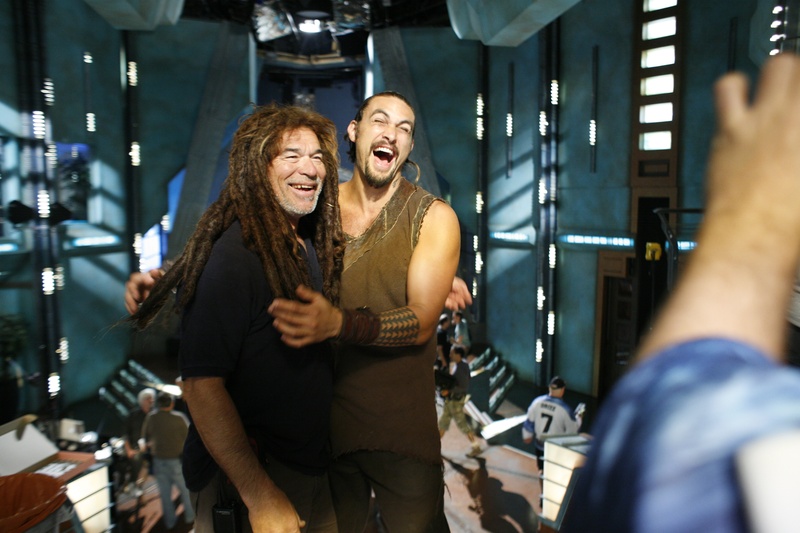 Atlantis has always been my favorite show of the franchise, and to see cast and crew in your photos always brings a feeling of wistful nostalgia. Very nice mailbag also, snark and all. Perhaps you should pick a day for a mailbag, with the caveat that any and all answers will be snark-filled. Sure, your detractors will use this as proof of your callous disregard for fandom, but they will believe that no matter what you say or do. But for the rest of us, we would get to watch a master wordsmith at work. Plus, it would be fun trying to come up with the questions to provide you the fodder for the quips, cuts, putdowns, and verbal flayings. Just something to consider. Thanks for a satisfying way to end the evening, and best wishes for Jelly. Thanks for the recipe! I have all the ingredients execpt the paprika tho I do have the cayenne… so, judging by the lack of eating the bacon it’s for drippings only, for flavour? I have, and use, the cast iron skillet almost daily so I’ll give it a try. Thanks again! 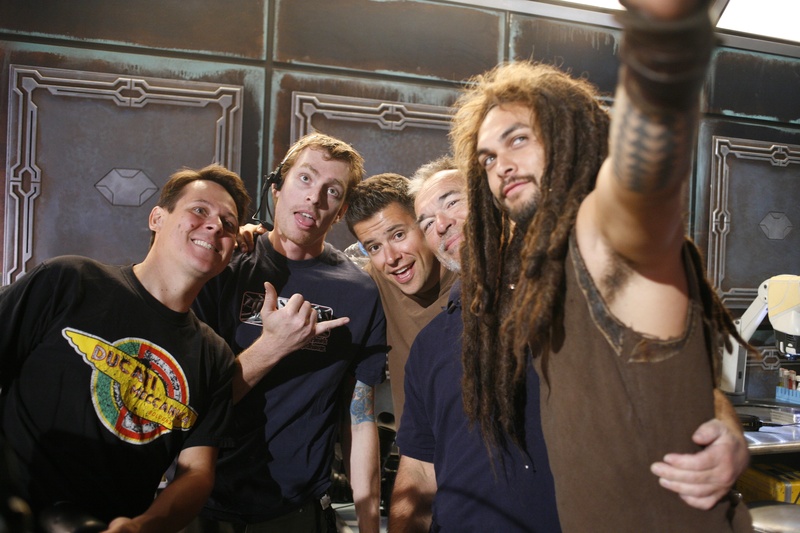 if the atlantis movie’s timeline has been changed to fit sgu, will that be the same for the sg1 movie? Question about the status of the sg-1 team: one of your mailers said that vala left sg-1 so my question is When did Vala leave sg-1? Is she atill part of the SGC or did she leave and revert back to how she was in season 8 and 9? Super Congrats on the book coming out! That has to be exciting. Oh, you can actually list on one hand what distracts you from writing? Try my day – two small kids. It’s not that I don’t ever get 15 straight minutes to think, but I don’t know when I sit down if the call to action will come in ten seconds or ten minutes so getting on a roll is pretty tough. It takes me days to fail to write what I can write if I can just slip away to Tim Horton’s for a few hours. Even without the 2 small children, my last trip to TH was cut short by false labor – oh, the irony that #3 is already distracting me. I think the gates were probably developed in the Ori galaxy based on “The Ark of Truth”. The ring technology definitely existed at the time the Ancients left the Ori galaxy, since the one group ringed to their ship from the underground base before leaving. Also, I think it was the Ori that started the plague in the Milky Way to eradicate the Ancients once and for all, which is what precipitated their leaving for Pegasus. Doubtlessly the Ori thought the Ancients had been destroyed long before they ever returned to the Milky Way after the disaster with the Wraith. So, if the gate technology already existed when the Ancients left the Ori galaxy, and the Ori were determined to wipe out the Ancients, I would think that Destiny would have been sent in the opposite direction to that of the Ori galaxy pursuant to the “why tempt fate” school of thought..
Hi Joe, this is no way to sound rude, do you read all the posts/ questions, i’m just wondering as there are a lot of posts, as I’ve asked many questions and non have been answered recently, I’m not trying to be rude, I know your too busy to answer every question people have given you. In other words, have I offended you in any way in any of my comments? Thanks, and sorry if this sounds confrontational, its not ment to. P.s, well done with the book! You don’t think the stargate movies campaign and mailing letters is any good? It’s better then sitting around and just waiting right? Thanks for answering my questions btw. Well twitter is down so I can’t get you the link… But this is what scifitv tweeted. 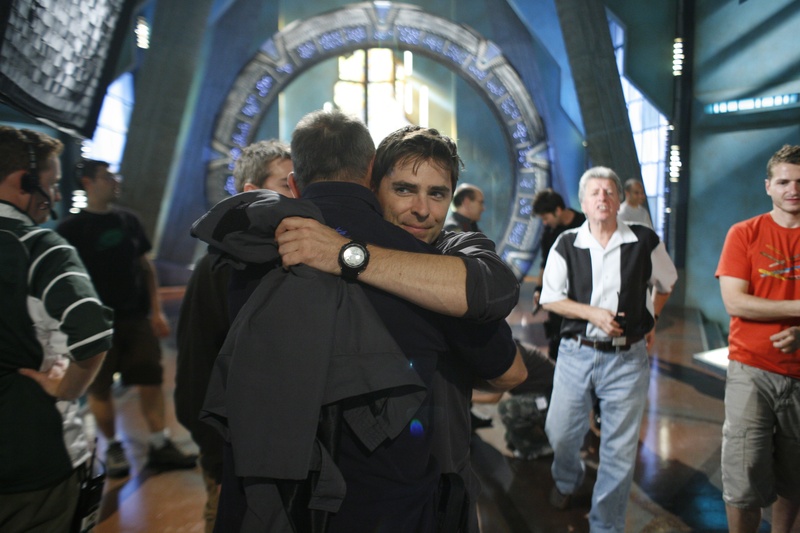 #SGA and #SG1 stars will appear in #SGU Season 2, says Brad Wright. So will there still be SG-1 characters in season 2? Joe thanks for the promised pictures. Great to see. Personally I think you should continue. It’s the thought that counts in all. I remember us discussing this just over a week ago I believe saying exactly the same thing, It won’t make a difference, it’s more a waiting game. But show your passion as a fan. It’l work. Oh and good luck on your script Joe. Postcard from Tokyo? To add to my collection? Yes? Hard to get too excited about Masked coming out when my copy will take at least 10 days for the US Postal Service to walk it from NJ to TX. Maybe they should start riding horses again. And by the way, your chocolate blog yesterday looked heavenly. (How does Akemi stay so slim hanging around you?) Suddenly the Kit Kat I was eating didn’t taste so good. Also: I thought “feeding cranky fans to Todd” was hilarious! @ Airelle – Yup, got mine from Amazon – a preorder. I started to read the first paragraph of Joe’s story, realized it was probably gonna be better than I expected. (No offense, Joe…but I had my reservations…a weird kind of ‘nervous for YOU’ thing that I usually only get when someone in the family has to stand up in front of everyone and give a speech, or something. I think this might officially make you my kid brother. ) So, anyway, I decided to wait until I have a full evening or afternoon to read the entire story, without interruption. @ Joe – You are so very, VERY naughty! Oh, and it would have been funny to see Jason’s wig on one of your pugs. (seems like he was always sticking it on somebody) Too bad you couldn’t have taken it home with you for one day to snap a couple of photos. Whatever happened to that wig? Gathering dust in props? 1. Check your Yahoo account(s), please. 2. Give poor Marius a break. I don’t think he’s a blog regular. @Marius: Hope you understand that Joe was joking about not having a plan. The short answer is, yes, there is a plan for SGU, but it is subject to change. Good News Dept. : Vancouver-area SG fan and talented artist /photographer Beth B. was just hired by the Sears Portrait Studio, Metrotown. If you are in that area, please support this deserving young lady. Joe, perhaps a formal portrait with the pups for your Christmas card? How much are we going to find out about the blue aliens in Season 2? I assume they have an agenda beyond “Hijack Big Ship. Wreak Havok Laugh Maniacally! Also, FTL is different than Hyperspace, but how much slower is it? In the past the ship has stopped when there was a need to refuel or to get needed supplies, are we going to see more of that? As things stand, the crew has to guess what the ship stopped to restock. Is the ship ever going to communicate more directly…like say via a certain missing crew member? Joe, thanks so much for the BTS Atlanis pictures! And the Rachel/Joe pic is sooo sweet. Well… I think the FanFic “SHEYLA” fans just get *ballistic* with that Rachel/Joe pic!! Hey…Joe! I think you ought to put out a cookbook. You always make me hungry when you talk about food on your blog. Especially, when you use pictures. Is there a way we can encourage MGM to green-light Extinction (SGA movie)….or even 3rd SG-1 movie? I’m starting to lose hope. But…I don’t want to lose hope. Please…say something encouraging.